All moms understand how the hectic pace of life can make it difficult to spend time focusing on your spiritual life. When the kids need to be fed and the laundry folded, prayer and Bible study can take a backseat. Julia Roller’s life changed forever when she became a mom, and as she experienced some post-pregnancy complications, she found herself spiraling into exhaustion and depression – feeling like an absolute failure. 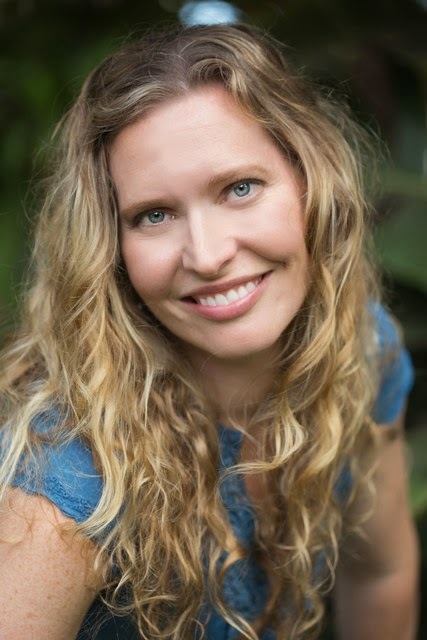 Though she felt far from God, she began to try to reconnect to her faith. Through study and practice she has learned how to make her spiritual life a priority. She shares this encouragement with other moms in her new book Mom Seeks God: Practicing Grace in the Chaos (Abingdon Press/April 1, 2014/ISBN: 9781426771026/$15.99). 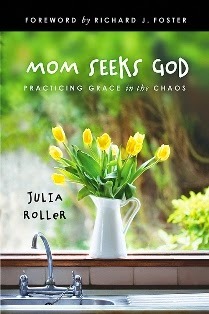 Roller seeks to inspire other mothers by sharing about her struggles as a new mom and how she was able to reconnect with God by reintroducing spiritual discipline into her newly changed life. Q: You write about 10 practices you focused on to bringing into your Christian life. That sounds very overwhelming to most of us. How were you able to gradually re-introduce the disciplines into practice? Ten does seem like a lot! And to think, I started off planning to do 12 — one per month for a year! But the thing is, most of these are things you’re already doing, at least in some fashion: prayer, worship, study, service. Doesn’t just about every mom in the world have a Ph.D. in service? What I tried to do was spend a month focusing on each one, trying to see how I could incorporate it better into my life. I hope readers will be encouraged to take a look at these practices with me, one at a time. And once they do, I think they’ll find, as I did, how closely these disciplines overlap and work together. For example, when I was focusing on simplicity I realized I was multi-tasking too much and should work on not having the radio or playlist or TV constantly on in the background. This realization informed my practice of silence. And practicing silence is inextricably linked to prayer. So again, in practice, for me it wasn’t about doing each of these practices by itself for a prescribed amount of time. One of the best realizations of the whole process for me was some of the most meaningful practices were taking things out of my schedule, doing less. For example, I fasted from TV. With simplicity, I worked to rid my life of catalogs. With silence, I tried not to listen to music all the time. These practices all gave me more time, or at least a sense of having more time! Read part 1 of Julia's interview here! Q: Could you share two or three ways moms can get in time for prayer and study in midst of their daily family routine? Absolutely! Prayer was my number-one priority. I knew I had to get some working prayer routines back into my life. For each person, this might require some trial and error as you figure out what method and time of day is going to help you pray consistently. What I realized was that I’m a natural night owl, and so for me, praying at night worked best. I know a lot of people (even moms with young kids) do well with rising early and having a time of prayer and/or study, but for me it was a lot more practical to pray at night. Something else I realized was there were a few things I do that seemed naturally conducive to prayer — walking the dog, taking showers, washing the dishes. When I could do those things in quiet, I often found them to be a good time for prayer. And as for study, my best recommendation would be to join a Bible study group. Studying the Bible together is so helpful for balance and encouragement and motivation. When I tried to study the Bible completely on my own, I found myself longing for others to discuss my questions with. Q: How does a new mother find balance between putting God first and making sure her baby has everything he needs? Well, obviously you’re not leaving your baby screaming in the crib so you can continue your Bible study or finish your time of prayer! I really struggled to find out where to fit God into my very busy day caring for a baby, and what I realized was these activities were very much God-ordained and I should think of motherhood itself more as its own spiritual discipline. For me the change was less about adding things in than changing the way I thought about caring for my baby’s needs. Q: There can be a dichotomy, especially for new parents, between being the perfect parent and still being the best Christian they can be. Don’t those two things really go together? I think so many of us put our children first, or at least try to, and end up putting our own needs on the back burner. We think more about shepherding our children’s relationship with God than deepening our own relationship with God. As much as I too fall prey to this kind of thinking, I believe it is a mistake. Our children learn so much more from what they see us do than what we say to them. I believe when my boys see me make time for Bible study and prayer and service, it is a much stronger lesson for them than if I simply told them those things were important. And I think when we do our best to have an intentional relationship with God, it gives us the strength and wisdom to be much better parents. Q: How important is it to give yourself grace and forgiveness? One of the most important lessons I learned throughout the year in which this book takes place was how much time I wasted feeling guilty about not praying or studying the Bible enough. What if I had just prayed during those times instead of feeling guilty? It was a destructive cycle that led not to more prayer or study, but less. I read something about Bible study in particular that really helped me. The author wrote that we study the Bible for ourselves, not for God. It’s God’s good gift to us that we can take advantage of, so if we find we have been away from the Bible for a while for whatever reason — life felt too busy, we forgot, we got out of the habit — we should just remind ourselves we’re missing out on a gift from God and come back to it. Q: As your children grow older, how can you introduce them to or include them in your practice of the disciplines? My boys are actually three and seven now, so there are lots of things we can do together. Service is a big one. My kids have way bigger hearts than I do. When I greet at church or deliver flowers or take someone a dinner, I always take them with me if possible. I want them to see how Christians take care of each other. I wrote in the book about how I wondered if I should have something to offer the homeless people we occasionally run into around town, and this past year we’ve started putting together little bags with a bottle of water, a granola bar, dried fruit and a dollar bill, and carrying them around in our car. When we see someone asking for help, if it’s safe (traffic lights, etc. ), my son rolls down the window and hands one over. I love seeing how good it makes him feel to help someone else. I also really love praying with them. Sometimes the prayers we say together at their bedtimes or mealtime are the most powerful and sustaining prayers I say all day. I have to admit I used to think of these prayers as more for them than for me, as almost example prayers that were important for their spiritual training but not necessarily as a way for me to reach God. Yet praying with them always feels like it brings me so much closer to God. They’re more unselfconscious than me and more trusting. I learn so much from the ways they talk to God.